As a kid in school, there was nothing better than going to art class, sticking your hands in a jar of paint, and dripping, splashing and smearing that paint across a page. With limitless possibilities and pure imagination, you created a world that you’d get so immersed in; all you wanted to do was share it with others. Proud and full of enthusiasm, you showed your creation to your teacher. She smiled and said it was nice, but maybe next time, you should stay within the lines. SIGH. But, for some individuals, coloring and painting outside of the lines is exactly what the Genie ordered. 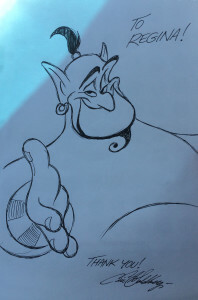 Recently, our Fingerpainters had the opportunity work on the Walt Disney Home Entertainment release of “Aladdin: Diamond Edition” with famed animator Eric Goldberg—the man responsible for giving us the film’s fun-loving Genie. Goldberg was the surprise guest at the special D23 event, where Disney fans relived the magic of “Aladdin” on the big screen, and were showered with exclusive memorabilia from the film and entertained by an insider’s look at the film from Goldberg. One of the event’s highlights was Goldberg’s stories about working with the late Robin Williams, who voiced Genie. Goldberg confessed he had to figure out a way to control his laughter while listening to Williams speak because the actor was just that funny. Goldberg also shared with the audience some memorable moments from his other projects, which include “Frozen,” “Wreck It Ralph,” “Hercules” and more. If there is a lesson to this story it should be this: Don’t be afraid to go outside the lines to create something original, to create something great. Create a whole new world, reach for the stars, and wish upon a star because you never know who is watching. 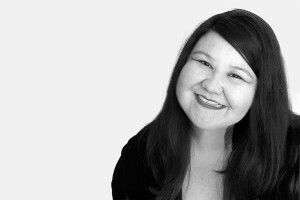 Regina works in the Film & Entertainment team in Scottsdale. A native Phoenician, she is a self-proclaimed Disney fan who also mildly obsessed with ‘80s and ‘90s boy band music and reality TV.